The Street Department recently purchased a 2016 Freightliner truck chassis with multiple body attachments. The truck is able to switch body attachments. The truck is able to switch from the standard dump truck body to a plow and sander configuration in the winter. The sander is designed to optimize the placement of material when treating winter roads and is designed to ensure that material is dropped where needed. 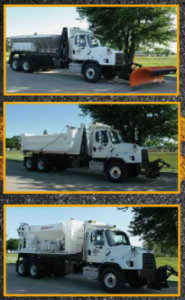 In addition, a concrete mixer from Cemen Tech was purchased that fits on the same chassis. The mixer is a volumetric concrete mixer that is designed to do a variety of concrete mixes. The mixer is designed to be less wasteful and eco friendly.